Joel B. Green has served on Fuller’s faculty since 2007 and was associate dean for the Center for Advanced Theological Studies from 2008 through 2016. He was named dean of the School of Theology in 2014 and provost for Fuller Seminary as of June 1, 2016. Prior to coming to Fuller, Dr. Green served for ten years at Asbury Theological Seminary as professor of New Testament Interpretation, as dean of the School of Theology, and as provost. 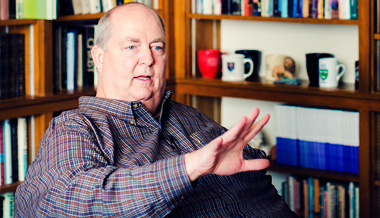 Green has written or edited more than 45 books, including seven that have won awards: Dictionary of Jesus and the Gospels (2nd ed., 2013), Common English Bible Study Bible (2013), Dictionary of Scripture and Ethics (2011), In Search of the Soul: Four Views of the Mind-Body Problem (with Stuart Palmer, 2005), Introducing the New Testament: Its Literature and Theology (with Paul J. Achtemeier and Marianne Meye Thompson, 2001), The Gospel of Luke (1997), and Dictionary of Jesus and the Gospels (with Scot McKnight, 1992). Among his most recent publications are Conversion in Luke-Acts: Divine Initiative, Human Cognition, and the People of God (2015), Why Salvation? (2013), The World of the New Testament: Cultural, Social and Historical Contexts (with Lee Martin McDonald, 2013), Ears That Hear: Explorations in Theological Interpretation of the Bible (2013), Wesley, Wesleyans, and Reading Bible as Scripture (with David F. Watson, 2012), Practicing Theological Interpretation: Engaging Biblical Texts for Faith and Formation (2011), Recovering the Scandal of the Cross: The Atonement in New Testament and Contemporary Contexts (2nd ed., with Mark D. Baker, 2011), the Two Horizons New Testament Commentary on 1 Peter (2007), Seized by Truth: Reading the Bible as Scripture (2007), and Body, Soul, and Human Life: The Nature of Humanity in the Bible (2008). He has written scores of essays and reviews. He is the editor of the New International Commentary on the New Testament, editor-in-chief of the Journal of Theological Interpretation, and serves on the editorial boards of the journals Theology and Science and Science & Christian Belief. Green has been elected to membership in both Studiorum Novi Testamenti Societas (SNTS) and the International Society for Science and Religion (ISSR). Green has 12 years of pastoral ministry experience and is currently teaching pastor at La Cañada United Methodist Church. Joel B. Green on seeing the whole pattern of life the scripture lays out. Joel B. Green's thoughts on reading the bible. Joel B. Green on reading the world and the bible well. Joel B. Green on embodied hospitality. Joel B. Green on the gradual opening up to God's agenda.